Aikidō derives mainly from the martial art of Daitō-ryū Aiki-jūjutsu, but began to diverge from it in the late 1920s, partly due to Ueshiba’s involvement with the Ōmoto-kyō religion. Ueshiba’s early students’ documents bear the term aiki-jūjutsu. One of the primary features of Ōmoto-kyō is its emphasis on the attainment of utopia during one’s life. This was a great influence on Ueshiba’s martial arts philosophy of extending love and compassion especially to those who seek to harm others. Aikidō demonstrates this philosophy in its emphasis on mastering martial arts so that one may receive an attack and harmlessly redirect it. In an ideal resolution, not only is the receiver unharmed, but so is the attacker. Aikidō is performed by blending with the motion of the attacker and redirecting the force of the attack rather than opposing it head-on. This requires very little physical strength, as the aikidōka (Aikidō practitioner) “leads” the attacker’s momentum using entering and turning movements. The techniques are completed with various throws or joint locks. Aikidō makes use of body movement (tai sabaki) to blend with uke. For example, an “entering” (irimi) technique consists of movements inward towards uke, while a “turning” (転換 tenkan) technique uses a pivoting motion. Additionally, an “inside”(内 uchi) technique takes place in front of uke, whereas an “outside” (外 soto) technique takes place to his side; a “front” (表 omote) technique is applied with motion to the front of uke, and a “rear” (裏 ura) version is applied with motion towards the rear of uke, usually by incorporating a turning or pivoting motion. Finally, most techniques can be performed while in a seated posture (seiza). Techniques where both uke and nage are sitting are called suwari-waza, and techniques performed with uke standing and nage sitting are called hanmi handachi. Thus, from fewer than twenty basic techniques, there are thousands of possible implementations. One feature of Aikidō is training to defend against multiple attackers, often called taninzudori, or taninzugake. Freestyle (randori, or jiyūwaza) practice with multiple attackers is a key part of most curricula and is required for the higher level ranks. “Randori”, literally “chaos”, exercises a person’s ability to intuitively perform techniques in an unstructured environment. Weapons training in Aikidō traditionally includes the short staff (jō), wooden sword (bokken), and knife (tantō). Most Aikidō systems add a pair of wide pleated black or indigo trousers called a hakama. Ueshiba’s senior students have different approaches to Aikidō, depending partly on when they studied with him. Today, Aikidō is found all over the world in a number of styles, with broad ranges of interpretation and emphasis. A list of Aikidō techniques can be found here. 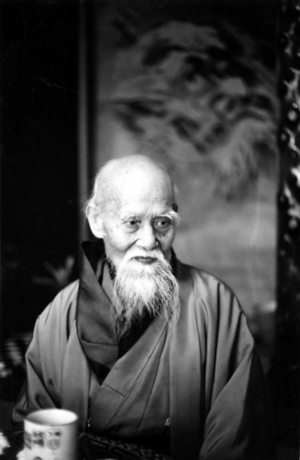 In addition, a series of quotes from the founder of Aikidō, Morihei Ueshiba, can be found here. While practicing the art of Aikido, following the methodology of Christian Tissier Shihan, I decided to create a web page illustrating Aikido techniques, arranged by grading. The web page can be found here (tsapanoglou.com/aikido). I have also included some famous quotes of the founder of Aikido, O’Sensei Morihei Ueshiba (1883-1969). Note: I would like to thank, one more time, Christian Tissier Shihan for allowing the use of necessary material. The original training material can be found here and here. Update 10/4/2012: A supplementary web page (tsapanoglou.com/aikido2) was created illustrating the same Aikido techniques, arranged by attack.